I’m GIVING away copies of Bailey Beats the Blah, a picture book assessment with the editor of Book Cover Cafe and signed artwork from illustrator Aaron Pocock on my BLOG HOP from November 3rd -18th. Follow the interviews, reviews and NEWS. 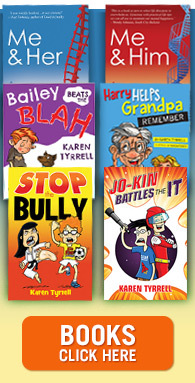 Download FREE teacher Notes, FREE children’s activities from KarenTyrrell.com Bailey is aligned with Kids Matter national education program. Bailey has received 5 STAR Reviews from Kids Book Review, teachers, counselors and Reviewers. Help Stamp out the BLAH! 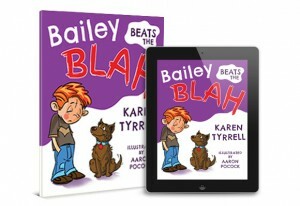 WIN: Copies of Bailey Beats the Blah, a signed Bailey artwork by illustrator Aaron Pocock and a picture book assessment with chief editor at Book Cover Café. Leave a comment on any of the 16 hops on the Bailey Beats the Blah tour Nov 3rd -18th. If you want to win the artwork, please leave #artwork after your comment. If you want to win the editor’s assessment, please leave #picbkassess after your comment. The more comments you leave the MORE chances to WIN. PLEASE Leave a comment BELOW and on each site ABOVE to increase your chances of WINNING! Will you be participating in the FUN? Thanks Stacey for supporting Bailey Beats the Blah Giveaway. 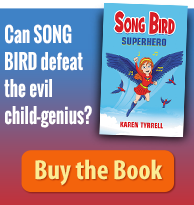 Congratulations Karen for writing such a fantastic children’s book giving children encouragement and empowerment so that they will feel better and perform better. 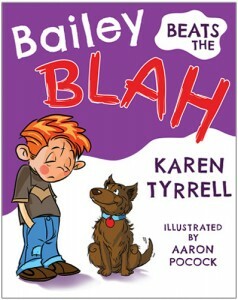 I gladly support your new book, “Bailey beats the Blah” and wish you continued success with it. Good luck on your tour karen. looks good! Thanks for supporting Bailey Beats the Blah. If you want to win the artwork, please leave #artwork after your comment. GOOD LUCK to you Karen. You deserve all the success you can get. Congratulations Karen! As you know I think you’re doing wonderful things for raising awareness about mental illness. This is yet another wonderful book! Boosting KIDS’ self-esteem and self-respect is a wonderful achievement. I wish you every success! Hi Karen! Many many congratulations on all your success so far and for your courage and commitment in bringing greater awareness to our precious young ones. I really think one of the most important things we can do is to be wonderful role models ourselves and talk openly about our feelings and how we beat our own blah times. Your book is certainly a wonderful way to start this kind of conversation! I believe children learn so much from what they see, as well as from what they are told and so if for instance we say “I’m feeling such and such” and then they see us do something that helps us feel good, it goes in deep! Thanks beautiful! Love this Book, what a great way to get kids talking with adults about their sad days! I will have my review on my blog soon. Hope the blog tour is going well, thanks for letting me be a part of it. I think the hand illustrations are wonderful. For recently published children’s books, there is only one other called “I Met a Monster on My Way to School One Day” – a 3+ age book, that has hand illustrated covers & not photo graphics, that I know of. So much more authentic & attracting! As a Child and Youth Worker and Mental Health Speaker, I am always excited to discover resources to help children develop increased resiliency, mental wellness and understanding. This sounds like a wonderful book! Looking forward to reading it someday and using it in classroom settings and one-on-one! 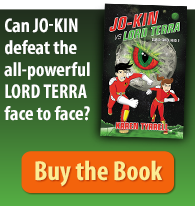 This is great for empowering kids and helping them into better citizens of the world. Job well done.